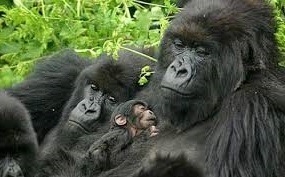 Uganda is by no means an ordinary destination considering its range of attractions and tourist activities which are featured in different safari packages like mountain gorilla trekking safaris and tours in Uganda, wildlife safari tour, chimpanzee trekking safaris and tours and cultural tours in Uganda. However, it should be noted that continuous marketing efforts are needed to fully exploit this potential and enhance the destination image. In this, Marlina Moreno – the American super model is anticipated to undertake a safari tour to Uganda with a group of high profile Americans to trek the 5,109m Margarita peak on the mystical legendary mountains of the moon – the Ruwenzori on 17th Jan, 2015. The Los Angeles based super model, Marlina Moreno is also a TV host and former cheerleader of the National Football League alongside modeling for other companies like NIKE, Canon, Samsung, Siemens and Virgin Atlantic. Therefore her safari tour in Uganda is by means not ordinary. Moreno desire to travel to experience the “Pearl of Africa” as described by Churchill in 1908 is significant move towards the showcasing of Uganda’s beauty. She is meant to profile the major attractions of Uganda that can attract world travellers to undertake Uganda safaris and tours like, culture and heritage, chimpanzees, wildlife, scenery, mountain gorillas among others for a documentary production which will be aired to the counts of Americans through Moreno’s travel platforms including the Huffing ton Post.com, Examiner.com and WhenInManila.com along with her travel blog Brunette Abroad.com. The media campaign will also feature a range of videos and travel articles to appear on at least two top websites of lifestyle and travel including filming of an Eco-travel show as part of pitch about Africa travel series. Along with the chief climber – Maria Mutagamba the Minister of Tourism, the American model will summit the snow capped peaks of the legendary mountains of the moon as described by Ptolemy a famous Greek geographer in 150AD which are one of the great activities normally undertaken by travelers on Uganda trekking safaris and tours.